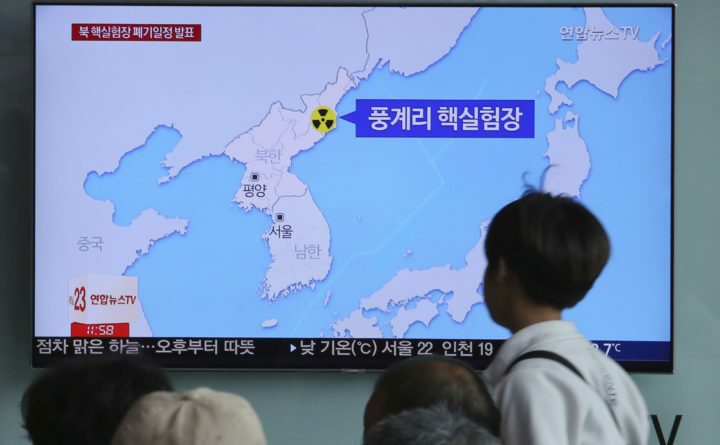 People on Sunday watch a TV screen reporting that North Korea will dismantle nuke test site during a news program at the Seoul Railway Station in Seoul, South Korea. North Korea said Saturday that it will dismantle its nuclear test site in less than two weeks, in a dramatic event that would set up leader Kim Jong Un's summit with President Donald Trump next month. Trump welcomed the "gracious gesture." The signs read: "Punggye-ri nuclear test." Following the Moon-Kim meeting, Moon’s office said Kim was willing to disclose the process to international experts, but the North’s statement Saturday didn’t address allowing experts on the site. The North’s announcement comes days after Washington announced that the historic summit between Kim and Trump will be held June 12 in Singapore. During their meeting at a border truce village, Moon and Kim vaguely promised to work toward the “complete denuclearization” of the Korean Peninsula, but made no references to verification or timetables. North Korea for decades has been pushing a concept of “denuclearization” that bears no resemblance to the American definition. The North has been vowing to pursue nuclear development unless Washington removes its 28,500 troops from South Korea and the nuclear umbrella defending South Korea and Japan. Kim declared his nuclear force as complete in December, following North Korea’s most powerful nuclear test to date in September and three flight tests of ICBMs designed to reach the U.S. mainland. Kim said during the meeting that the nuclear test site’s mission had come “to an end” because the North had completed developing nuclear-capable intermediate-range missiles, ICBMs and other strike means. The North also said for the first time at the meeting that it had been conducting “subcritical” nuclear tests. These refer to experiments involving a subcritical mass of nuclear materials that allow scientists to examine the performance and safety of weapons without triggering a nuclear chain reaction and explosion. North Korea’s reference to such activity is designed to communicate that even without underground testing, the country intends to maintain its nuclear arsenal and be a “responsible” steward of those weapons at the same time, said Andrea Berger, a senior analyst at the Middlebury Institute of International Studies. But in September 2008, the North declared that it would resume reprocessing plutonium, complaining that Washington wasn’t fulfilling its promise to remove the country from the U.S. list of state sponsors of terrorism. The administration of George W. Bush removed North Korea from the list in October 2008 after the country agreed to continue disabling its nuclear plant. However, a final attempt by Bush to complete an agreement to fully dismantle North Korea’s nuclear weapons program collapsed that December when the North refused to accept U.S.-proposed verification methods.